Black Horehound - Ballota nigra. Elements Applied: Each part of the herb, except the root, is applied in dried condition. Active Components: Diterpenoids, like 7-acetoxymarrubiin, ballotinone, marrubiin, ballotenol, and ballonigrin. Used For: The herb is known to prevent vomiting, soothe the nervous system, induce menstruation, treat diarrhea, and provoke expectoration. Black Horehound is particularly applied for treating sickness and vomits associated with nervous tension and disorders, but not the digestive system. For instance, the herb is helpful in motion nausea. 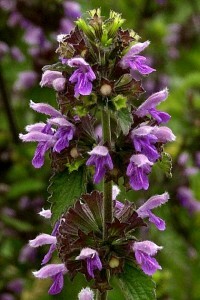 When it comes to nausea connected with anxiety, Black Horehound is also valuable. Additionally, the plant is used for regulating menstrual cycles, and inducing expectorative activity. Additional Info: The plant is indigenous to various areas of Europe, and specifically raised in Great Britain. Preparation and Intake: To make an infusion take 1-2 teaspoons of herb extract (dry) and fill it up with a cup of boiled up water, let steep for 10-15 minutes. The result is taken thrice a day or when necessary. Commonly mixed with: To prevent sickness and vomiting the herb is mixed with Chamomile, Peppermint, or Meadowsweet.